The comprehensive Skybox platform gives enterprises the total visibility and analytic-driven intelligence they need to protect their network and fight cyber attacks fast. Skybox Enterprise Suite automates security management processes that assess, analyze, and remediate risk, bringing response times down from days or longer to hours—even minutes. To stay ahead of threats to your network, first you need to see it. Skybox vulnerability and threat management solutions build on our core principal of total network visibility. Our innovative network models go beyond the map and give you a continuous view of your assets, even network devices and other “un-scannables.” Combined with threat intelligence from more than 80 different data sources, you’ll always know what’s at risk even between network scans. Skybox Vulnerability Control: Complete vulnerability assessment, automatic prioritization in your network’s context, and recommended remediation actions neutralize emerging threats and keep you secure every day. Skybox Threat Manager: Evaluate the latest threat intelligence against the context of your assets, highlight potential business impacts, and automatically prioritize vital threats. With continuous monitoring and visibility, you can take command of your security policy management all from one centralized platform. In one view, see how your security controls work together or leave you exposed. Our automated, integrated solutions ensure firewalls and network devices are effectively configured for security as well as compliance. Skybox Network Assurance: Bring your network topology into view, perform end-to-end path analysis, and get answers to connectivity and device configuration questions in seconds. Skybox Firewall Assurance: Examine firewall rules and configurations automatically to keep your network secure, optimized, and in compliance with minimal effort. 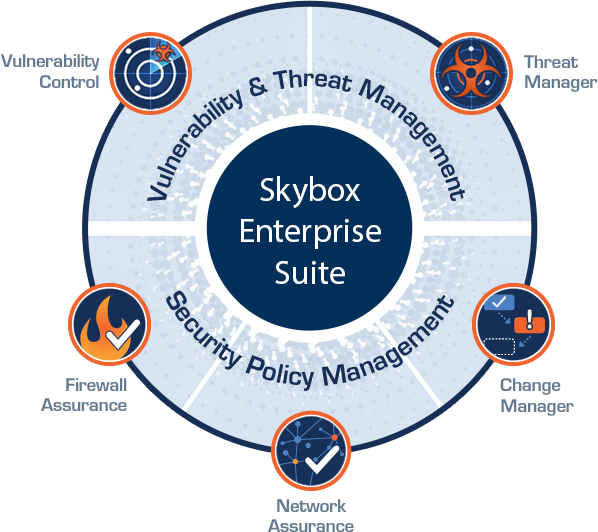 Skybox Change Manager: Assess the risk of proposed firewall changes with incorporated vulnerability intelligence and security policy data all in an automated change management workflow.